After being available on Blu-ray 3D only in a Samsung Blu-ray 3D player or 3D TV bundle, all four Shrek movies can finally be bought by themselves. The Shrek, Shrek 2, Shrek the Third and Shrek Forever After Blu-ray 3D discs are combo packs with the animated family films on DVD as well. Franchise spin-off movie Puss in Boots is available on Blu-ray 3D the same day as Blu-ray and DVD. Based the book by William Stieg , the green ogre’s (Mike Myers, Austin Powers) first film, released by DreamWorks Animation in 2001, won the Academy Award for Best Animated Feature and was also nominated for Best Adapted Screenplay. In the movie, Shrek gets pushed out of his swamp and the only way to get some peace and quiet is to rescue the fiesty Princess Fiona (Cameron Diaz, Bad Teacher) with the help of the talkative Donkey (Eddie Murphy, Tower Heist). In Shrek 2 (2004), the ogre couple must tell Fiona’s parents (John Cleese of Winnie the Pooh and Julie Andrews of Despicable Me) about their love and face off against Prince Charming (Rupert Everett, Wild Target), who has his eyes set on marrying Fiona for her kingdom. And Shrek gets an unlikely ally in Puss in Boots (Antonio Banderas, You Will Meet a Tall Dark Stranger). 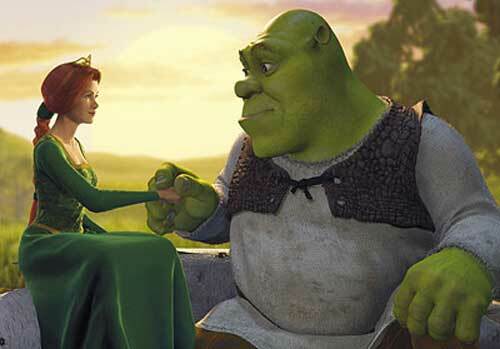 Shrek the Third (2007) finds Shrek as the heir to the throne, a seat he’d rather not inherit. So he sets off to find the legitimate heir in a distant kingdom, while Prince Charming joins the fairytale villains in plotting a coup to become the next king. And in the final film, 2010’s Shrek Forever After, the ogre is having a mid-life crisis and gets tricked by Rumpelstiltskin (Walt Dohrn) to erase Shrek out of existence, which leads to a timeline in which Rumpel rules supreme. And, of course, Shrek must fix his mistake. Best Buy had an exclusive window. They are high, but $35 is usual for the Blu-ray 3D. Once they hit more retailers, you should be able to find them available for less.